In contrast to First Maccabees, the book of Second Maccabees is a summary of a history written originally in Greek for Diaspora Hellenistic Jews living in the Greek-speaking area in Egypt. The Jews to whom the book was addressed were both loyal to their nation and its new Hasmonean state and yet faithful subjects of the kingdoms of the Greek dynasty of Ptolemies in Egypt. Jason of Cyrene wrote the original five-volume history of the Maccabees which was later summarized by anonymous “epitomizer” in Second Maccabees. The original has not been preserved. Note: The Books of Maccabees are not part of the Hebrew Bible. Nevertheless, they provide the historical information concerning the Maccabean revolt and Hasmonean rule. The author of First Maccabees, who wrote for Judeans, sought to promote the legitimacy of the Hasmonean priesthood and its political rule. However, Second Maccabees seeks to explain to Diaspora Jews and Greeks alike that the Maccabean revolt was not the result of an inevitable clash of two cultures–Hellenism and Judaism–or of two peoples, Hellenes and Jews. The bloodshed was really unnecessarily caused by an unholy alliance between money-hungry so-called priests and irrational Greek leaders who caused the desecration of an ancient Temple and the persecution of a legally protected religion. 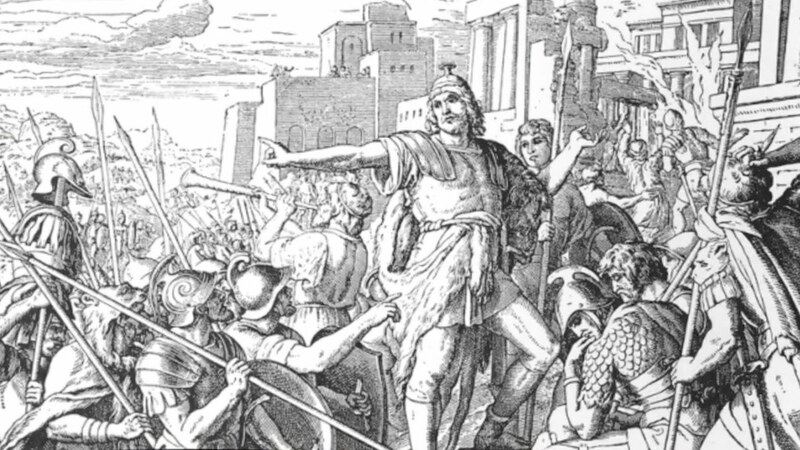 The Jewish villains, Jason and Menelaus, threatened the peace of the city by undermining traditional Greek respect for native religious and legal practice. Greek readers, who always respected ancient traditions, were sure to condemn these Jewish innovators who wrought havoc. In Second Maccabees there is a unique emphasis on religious martyrdom — Hannah and her seven sons, and Elazar the elderly scribe are presented as philosophers rationally defending the decision to die rather than to abandon their ancestral faith. Their deaths are seen not only as a way to sanctify God’s name, but as a way to vicariously remove the sins of Israel and to evoke a supernatural intervention by God. This new phenomenon of religious martyrdom reflects the kind of religious loyalty valued in particular in the Diaspora. Their voluntary, tortured deaths assuage God’s wrath over the desecration of the Temple by false high priests and explain Judah’s victories as God’s salvation in response to the death of the Jewish martyrs as well as God’s appropriate punishment for Antiochus IV’s insufferable arrogance (II Maccabees 9). Supernatural intervention abounds in Second Maccabees, while religiously motivated military initiatives are emphasized in First Maccabees. (The miracle of the vessel of oil that burned for eight days is never mentioned in any of the Books of the Maccabees, and it appears only in later Rabbinic sources.) The literary style chosen by Jason of Cyrene highlights the martyrdom. It is a melodramatic Greek style that describes graphically the death of innocent children, women and old men. It seeks to shock the audience with tear-jerking violence and to inspire the reader with heroic resolve to suffer horrendous torture rather than commit idolatry. The summary of Jason of Cyrene was created by someone seeking to legitimize the celebration of Hanukkah in Ptolemaic Hellenistic Egypt. Therefore the anonymous “epitomizer” (summarizer) provides an abbreviated history with two letters written in 142 BCE by newly independent Judea to the Diaspora Jews in Egypt. The letters call upon their brothers to observe Hanukkah as the holiday of the rededication of the Temple. Reprinted with permission of the author from A Different Light: The Big Book of Hanukkah, published by the Shalom Hartman Institute and Devora Publishing. Their rule falls short of expectations. Why Were the Rabbis So Uncomfortable With the Maccabees? At Hanukkah, shifting the focus from militarism to miracles. The Maccabees: Heroes or Fanatics? The Maccabees triumphed over the Syrian Greeks and liberated the Temple, but their legacy is not so clear.